Pro football player and Super Bowl champion DeMarcus Ware and actor and country singer John Schneider were sent packing based on the combination of home viewer votes from last week and the scores provided by Dancing with the Stars judges Len Goodman, Carrie Ann Inaba and Bruno Tonioli on Monday night. "We're really going out on a high note, and the thing is, this 'Team Dance' just showed us what this show is about. It's about family and everyone coming together. The thing is, I felt like I won every week. I learned something every single week and it was amazing for me, so thank you," DeMarcus, who was paired with pro Lindsay Arnold, said following his ouster. John then addressed his professional partner Emma Slater and said, "I am so grateful that you were my partner and that you were my coach throughout this whole thing. This was truly one of the best experiences of my life, so thank you!" Actress and Harry Potter star Evanna Lynch and partner Keo Motsepe were also in jeopardy of elimination prior to John and DeMarcus' departures; however, they were not necessarily one of the bottom-three couples based on judges' scores and America votes. Dancing with the Stars - "Country Night"
"Country Night" featured each celebrity and professional pairing performing two numbers. The first was a couple's dance featuring a style not yet performed, whether it be a samba, Viennese waltz, rumba, cha cha, jazz, Charleston or foxtrot dance. And the second routine was a "Team Dance" in which all of the couples were divided into two teams -- #TeamHayNow and #TeamJoeDown -- for a special country-themed, supersized freestyle. #TeamHayNow was comprised of country music radio personality Bobby Bones and partner Sharna Burgess, singer and dancer Milo Manheim and partner Witney Carson, Evanna and Keo, and John and Emma. They danced to "9 to 5" by Dolly Parton and received 29 out of 30 judges' points. 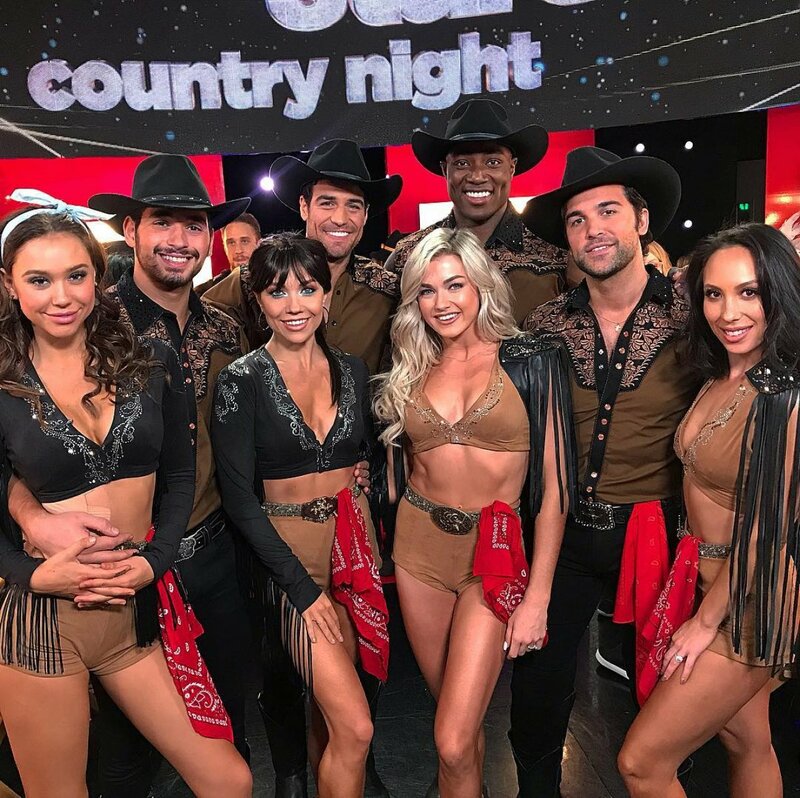 #TeamJoeDown featured model and Cover Girl Alexis Ren and partner Alan Bersten, Bachelor in Paradise star Joe Amabile and partner Jenna Johnson, DeMarcus and Lindsay, and actor and Fuller House star Juan Pablo Di Pace and partner Cheryl Burke. They performed to "Country Girl" by Luke Bryan and received 26 points. Evanna and Keo topped the judges' leaderboard on Monday night in first place with a total of 59 out of 60 possible judges' points. The couple initially danced a rumba to "Every Little Thing" performed live by Carly Pearce that earned a perfect score of 30 points. Milo and Witney finished the night in second place with a combined total of 58 points after dancing a 29-point worthy foxtrot to a live performance of "Born to Love You" by LANCO. Although Juan Pablo and Cheryl received a perfect score of 30 points for their individual dance, a Charleston routine set to "One Shot" by Hunter Hayes, they placed third on the leaderboard with 56 total points thanks to the "Team Dance" round. Fourth place on the leaderboard belonged to Alexis and Alan, who first danced a samba to a live performance of "Ladies in the '90s" by Lauren Alaina that received 29 points from the judges. They walked away from the night with 55 total points. John and Emma finished "Country Night" in fifth place with a total of 54 points. They initially took the stage with a jazz routine to "Thank God I'm a Country Boy" by John Denver that earned 25 judges' points. DeMarcus and Lindsay claimed sixth place on the leaderboard with 53 total points, which included 27 points for their individual Viennese waltz to "Tennessee Whiskey" by Chris Stapleton. Bobby and Sharna placed seventh on the leaderboard after dancing a Viennese waltz to a live performance of "Can't Help Falling in Love" by Chris Janson that received 24 points from the judges. Bobby and Sharna's total for the night was therefore 53 points. And finally, Joe and Jenna finished in eighth -- and last -- place with a total of 47 points. They first took the stage with a 21-point worthy tango routine to "Burning Man" by Dierks Bentley featuring brothers Osbourne.